Apple is one of the biggest Company to Produce Gadgets and iPad is one of the best selling Tablet . iPad3 will go on Sale for this Friday on 16 of March. iPad3 comes with New features like Thinner and Sleeker Design with HD Screen Display.Latest feature which comes to iPad3 is wireless technology Send Data and Charge your iPad3 wirelessly. Apple iPad3 has 9.7 inch Display and Comes with Retina Display which has Razor-sharp text and Richer colors. Screen resolution of iPad3 is 2048 x 1536 pixel. With iPad3 you can view Photos and Video with Rich detail and with 3.1 millons pixel powered by A5X chip. Apple has recently released the beta version of iOS5 update, the iOS 5.1. iOS5.1 is in beta Version hence it’s release date has not revealed. So iPad3 comes with iOS 5 Update which comes with Multitouch gesture Technology. iOS 5 have features like Multitasking, App switching, Notification etc. New Apple iPad3 comes with A6 Quad-core Processor which makes More powerful then iPad2 and has a High end Desktop. A6 Quad-core Processor will be the best Processor in next few years. A dual-core A15-class processor operating at 1.7GHz . Apple iPad3 Comes with Improved Camera and also support LED flash which was not there in iPad2. iPad3 comes with 5MP camera with 1080p and 720p Video recording and it can capture 60 frames per second. 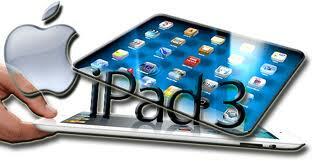 Apple iPad3 has been built with latest wireless technology, iPad3 can connect fastest data transfer upto 4G LTE. iPad3 can act has personal Wi-Fi Hotspot so that you can share your high speed data connection on your iPad.You can also connect upto 4 devices at a time over Wi-Fi, Bluetooth or USB. Apple iPad3 will be released on Friday 16 of March 2012. 8 Apple iPad3 will be released on Friday 16 of March 2012.